This illustration of Mason Evans is from an April 30, 1890, Chattanooga Times article, "Wild Man Captured!" Stories of the wild man have been with us since the beginning of time. On April 27, 1886, Chattanooga Commercial reported that both a wild man and a wild woman had been captured near Morganville outside Crawfish Springs, Georgia. The article noted the woman used her long nails to climb trees. Neither of the pair communicated. When sufficiently tamed, they were to be exhibited at dime museums in the North. In March 1889, Walker County, Georgia, citizens read about a wild man on Lookout Mountain who resided in a cave near Pond Creek. He had long matted hair and wore only a bear skin. The article failed to disclose whether he was captured or continued to live in the wild. The Chattanooga Press in January 1905 reported on a wild man captured near Luray outside Jackson, Tennessee. The man was described as "covered from head to foot with long, thick hair." He was to be given clothes and "civilized as much as possible." The best documented wild man story in this area involved Mason Kershaw Evans, a citizen of Monroe County, Tennessee. He was reported to be highly intelligent but came to be known as the "hermit of the Chilhowee." Born on May 10, 1824, Evans received a good education and was a respected member of the Tennessee Militia. He taught students in several one-room schools. Several theories were offered to explain why a man of scholarly refinement, "genial presence and manly deportment" left to wander the mountains and live the hermit's life without the comforts of heat, food, light and four walls. Some conjectured that while teaching at Hickory Grove in Monroe County, he lost control of his classes and was discovered "suddenly jumping and clapping his hands, running his fingers through his hair and laughing foolishly." The commissioners refused to pay him, and he was believed to have left in despair. Others thought Evans' madness came from rejection by a young female teacher whose father paid her to avoid marrying Evans. The trauma appeared to overwhelm him, whereupon he cut off all contact with others. Another explanation attributed his mental breakdown and departure from society to a fever. "Whether his lunacy was caused by a romantic love escapade, disappointment in love; religion; or too hard study will never be known," reported the Chattanooga News on Jan. 31, 1892. In any event, Mason Evans fled to live sometimes in cabins, subsisting on what he found in the woods and what others gave him. He spent much of his time on Starr Mountain in Monroe County, where his strange, isolated lifestyle led to his status as the "hermit of Chilhowee." Residents in McMinn and Monroe County either assisted Evans or fled from him as he wandered the mountains. "Wild Man Captured!" was the headline of The Chattanooga Times April 30, 1890. The story advised that citizens need not be concerned. Many times during his sojourn he was captured in the hopes of having his madness cured in an asylum in Nashville. Others tried to exhibit him. Evans always made his way back to Panther Cave on Starr Mountain. He ate meat cooked when possible, raw when not. He found berries, nuts and edible plants. "The old fellow is a mass of rags and bushy fair and beard with a wrinkled, devilish face." (Chattanooga Commercial, Jan. 16, 1886). His brother-in-law, J. H. Coltharp, built him a shack on his property and gave him food, but Evans carried most of his edibles in a sack or in a tied pair of pants. "In this sack there was a medley indescribable, meat, raw and cooked, nuts of various kinds, bread, corn, potatoes, and frequently butter, all mixed up in a conglomerated mess." (Chattanooga News, Jan. 31, 1892). He used rocks to pound nuts and a large stick to aid him in his travels. Early in his solitude, he used the stick to write or solve equations in the sand. 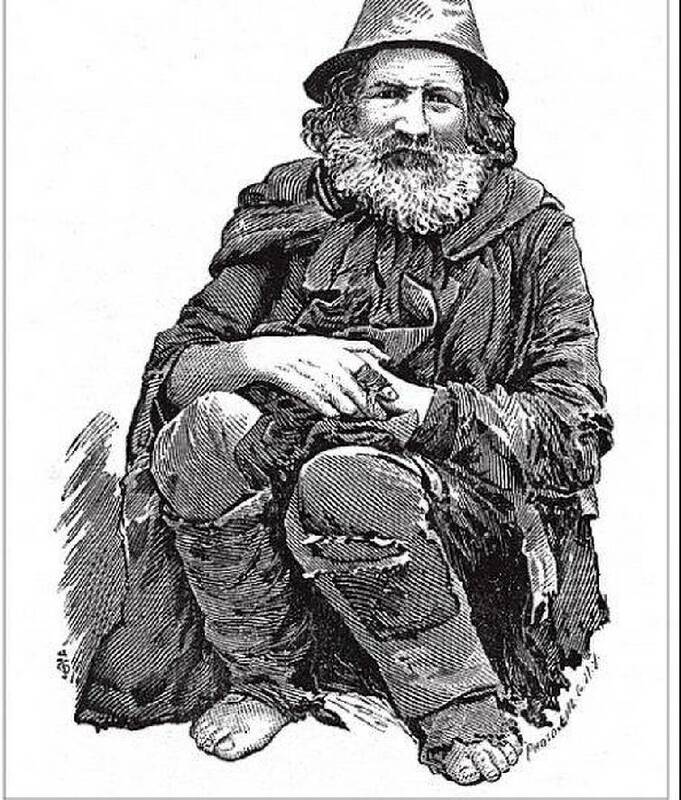 At age 67, the "Wild Man of the Chilhowee" became ill on Jan. 6, 1892. His frozen body was discovered five days later, and he was buried in Hickory Grove Cemetery in Monroe County, near the grave of his father, Robert. His 40 years of wandering were over. Robert Frank McKinney wrote a fictional account of Mason Evans in 1976 titled "Torment in the Knobs." Suzette Raney is archivist at The Chattanooga Public Library. For more information on Evans, other wild men and Tennessee folklore, visit the local history department of The Chattanooga Public Library or call 423-643-7725. For more visit chattahistoricalassoc.org.